The bus trip from Yazd to Shiraz took seven hours, which I passed in conversation with a fellow passenger, a middle-aged Iranian man who spoke extremely good English. Keen as I was to learn about his life, he was twice as eager to grill me on the social mores of my own country: everything from the legality of marriage between cousins to the role of nepotism in obtaining jobs. By the end of the ride I was exhausted, and his questions had probably outnumbered mine four-to-one. I checked into the Aryo Barzan hotel, which was the kind of establishment where the staff wear immaculate uniforms, everything is covered in plush red padding — and people like me, who have trouble keeping the desert dust from turning their trouser cuffs white, feel like we should have come in through a tradesmen’s entrance rather than the front door. In a Western country it would probably have charged a thousand dollars a night, rather than forty. 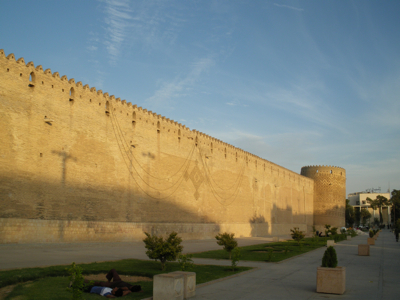 I went out in search of dinner, wandering past the Arg-e-Kharim Khani, an old fort that sits in the middle of town, only to be waylaid for English practice. This time it was a young Afghani man, a refugee who had lived in Iran since infancy. Unlike most Afghani refugees here, who are Hazaras — an ethnic group who generally have East Asian features — he was a Tajik, making it far easier for him to pass as an Iranian in many situations. But he still did not have citizenship, and wasn’t very happy with his situation. From my hotel in the centre of town, I walked west then north, expecting to cross the Koshk River. 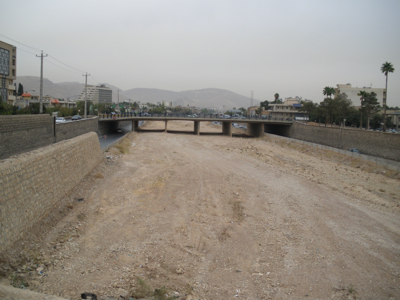 I walked over the bridge along Azadi Blvd, but below was just a dusty river bed. I suddenly recalled the Afghani man telling me the night before that there’d been a drought in Shiraz for several months. 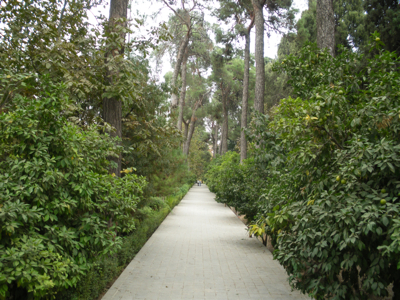 After walking through Azadi Park (where a few young people were camping out in tents, apparently as a kind of protest against high rents), I reached the Bagh-e-Eram: once the gardens of a small Qajar palace, and now the home to a botanical collection belonging to the city’s university. Despite the large number of visitors passing through the gates, this place is so vast that it just soaks them all up, and most of it remains quiet and calm. When I averted my gaze from the signs identifying various plant species, this still felt more like a palace garden than anything else. I could easily imagine people plotting assignations and intrigues as they strolled decorously down the tree-lined avenues. While I was there it began raining lightly, the first rain I’d seen since arriving in the country. 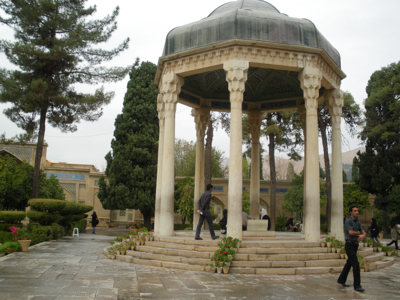 I left the gardens and headed east, to the tomb of the fourteenth-century Shirazi poet Hafez. I must confess that I’ve read none of his work besides a few fragments on the internet, but he is very highly regarded in Iran and is said to have influenced Emerson and Goethe. The visitors here were mostly young Iranians, so there doesn’t seem to be much risk of his reputation fading in his homeland. Shiraz also boasts the tomb of another poet, Sa’di, but having read none of his work either, one poet’s tomb was enough for me. Growing hungry, I headed south towards the city’s bazaar. On the way, a student tried to lure me into yet more English practice, but after almost ten hours of talking the day before I wasn’t in the mood. I found a tea house in the bazaar, but — apart from the tea — there was nothing without meat on offer. After wandering around near Valiasr Square, I chanced on a tiny place with kuku-ye-sabzi (vegetable omelette) among the dishes spelt out in the window. For some reason they served it in a hamburger bun, but that was fine by me; I was starving, and it was delicious. As I was dawdling in Valiasr Square digesting my food, an Iranian man approached me and asked for directions; I didn’t understand everything he said, but kojast? (where is it?) was the centrepiece of my vocabulary. And though I couldn’t help him, after being picked so many times as an obvious foreigner there was something gratifying about being mistaken, however briefly, for a local. I’d been walking most of the day, so I tried to get an early night, but my floor of the hotel turned out to be occupied by a tour group of Dutch retirees, who spent most of the night going back and forth between each other’s rooms, talking loudly, slamming doors and giggling in the corridors. 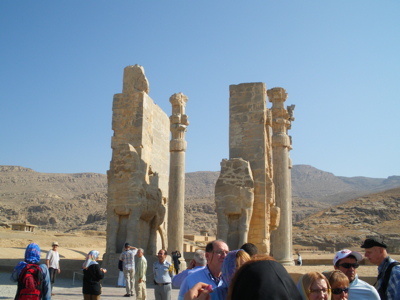 On my last full day in Iran, I took a guided tour of Persepolis, which lies about seventy kilometres from Shiraz. 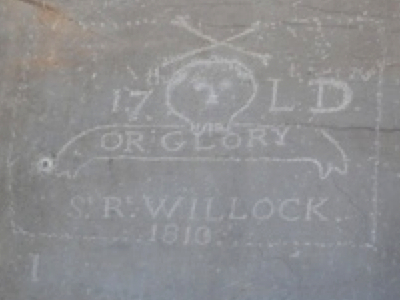 The site is close to 2500 years old. 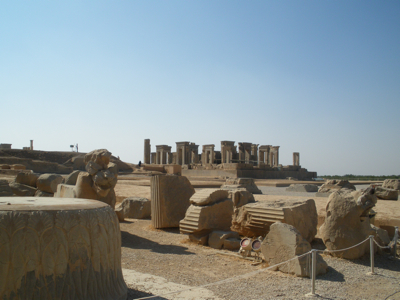 The Achaemenid ruler Darius the Great and his successors would receive tributes here from their numerous subject nations at the New Year’s celebrations. 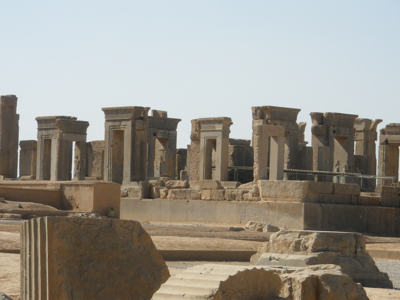 It was burned to the ground by Alexander the Great in 330 BC. Choosing to go there in a tour was a mistake; although it was convenient for the sake of transport to the site, our guide was on a schedule and he rushed us from place to place, leaving little time for contemplation. Our group consisted of three Iranians, a Ukrainian man who spoke almost no English (or Farsi), and myself, so I did feel sorry for the guide having to give his commentary in both English and Farsi when the English was really for my benefit alone. With hindsight, I should have just taken a taxi, bought my own ticket at the gate, and then been free to wander around in my own time. 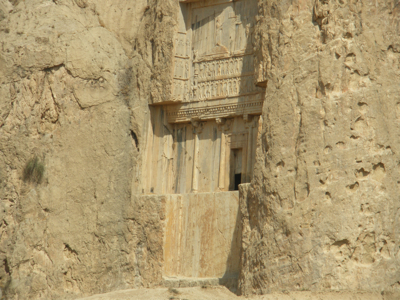 After Persepolis, the tour took us to the nearby site of Naqsh-e-Rostam, where four Achaemenid emperors were interred. 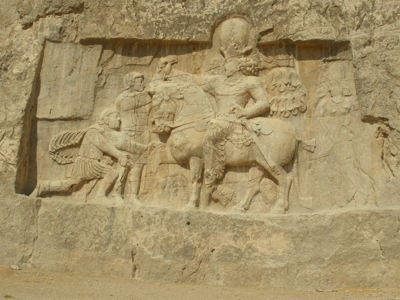 Later, in the Sassanid period, rulers had stone reliefs of themselves and their military victories carved beneath these tombs, in order to cash in on the glamour of their famous predecessors. I caught a bus from Shiraz to the airport; it was my first ride in a suburban bus, and it cost the equivalent of five cents. Away from the city centre, we passed concrete tower blocks as grim-looking as any of the high-density housing projects that low income people are herded into in many Western countries. The bus went by Shiraz’s international airport, but I hadn’t been smart enough to book a flight home from there, so I had to find the domestic one, which wasn’t well sign-posted. I walked for fifteen minutes down a road towards a promising-looking complex, had second thoughts and turned back in search of signs or information, and then finally asked a passing driver; I’d been headed in the right direction, before I’d turned around. In the airport, two male pilots in uniform strolled across the terminal hand-in-hand. Though I’d read many times that it was common throughout the Middle East for platonic male friends to hold hands, this was the one and only time I saw it in Iran. The flight from Shiraz to Mehrabad Airport in Tehran did not take long. I caught a taxi to Imam Khomeini Airport, the international terminal. On the flight to Kuala Lumpur, I sat beside a young Iranian woman who had studied environmental engineering, and was hoping to do a PhD in Australia, though she was having trouble getting permission from the Iranian authorities; this time her trip was only taking her as far as Malaysia. It was seven in the morning in Kuala Lumpur when we arrived; my flight home was leaving at half past nine, so I drank coffee and paced the airport to stay awake. On the plane, one of the movies on offer was Unfinished Sky, about an Afghani refugee on the run in Australia. We touched down in Perth at four in the afternoon. 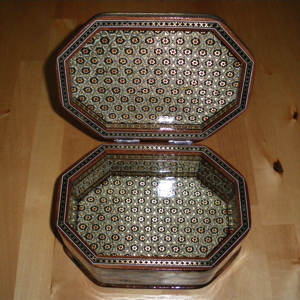 I declared my wooden boxes for quarantine checks, but there was no problem — the way they’d been made apparently precluded any Trojan insect pests that might devastate Australian forests. I walked from the airport down to the main road and caught a bus to the city, disoriented by the familiar landmarks, all the English speakers around me, and people’s odd clothes. I bought some food with the strange local currency, then went home to sleep for twelve hours. Postscript: I later heard from a friend that while I’d been in Iran, the authorities had “arrested” two pigeons near Kashan — the city I’d had to drop from my itinerary when my flight out of Australia was delayed. Apparently they had come too close to a nuclear facility, and were suspected of spying. Copyright © Greg Egan, 2009. All rights reserved.